With the weather continuing to scorch us, it is essential that we all consider our animals’ welfare - water and shade being top of the list. This month Jason’s home farmer article focuses on summer care for your poultry. 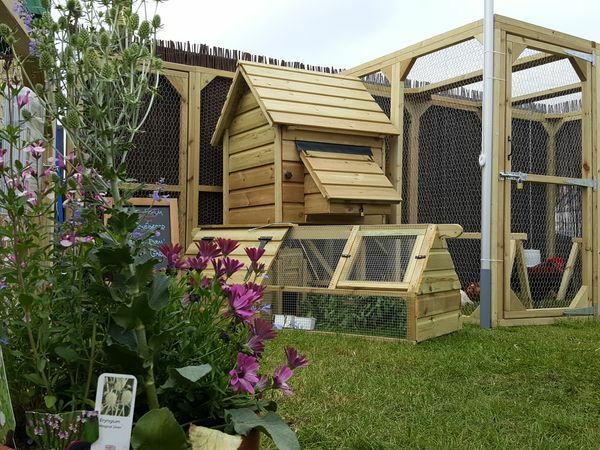 Please take the time to have a read for some practical ideas and suggestions to help your birds through these hot summer days. Don't forget, it's not just poultry that need our help, much of the article can be applied to many of our other animal friends. They say in "the biz" that you shouldn’t work with animals or children. Well with all the animals around the farm that’s a little tricky, but we pushed our luck this week when we thought we had a lovely idea! At the South of England show we ran a competition, and so back at the farm had to find someone to make the draw. After some discussion (and silly suggestions) we decided none of us knew any celebrities to do the job, and so we thought what could be better and more independent than one of the animals?? (As it turned out - a really silly suggestion!) The goslings came top of the list - so cute and with a liking for eating cardboard (their first few weeks were spent in a box in our kitchen, until they ate their way out and had a lovely time wandering around the house!) So, one sunny afternoon with help from Ernie and Ben (should we have also involved children??) 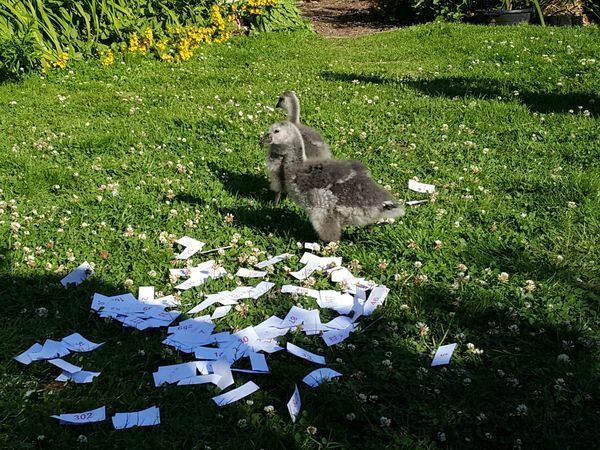 we spread around the garden little pieces of paper, each with a number on, the idea being that a gosling would peck at a random number and we would have a lovely photo of the number in its beak... Well, several hours later and they had showed no interest whatsoever! We sprinkled crumb, mealworms, seed, even water on the numbers and they just wouldn’t take part, so next we tried quail, then chickens and then a last resort... the geese. Thankfully, the geese took part well, too old and wise for all this messing around and loving the chance to eat anything. The problem here was getting to the numbers before they ate them (or us!) 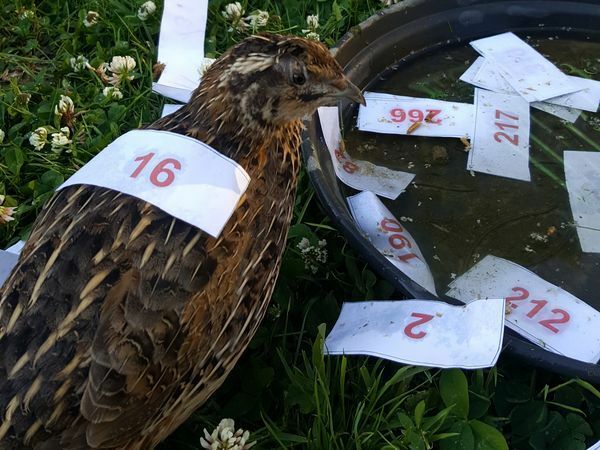 Well, they made an obvious selection, the winner was the first number pecked at but not eaten! (Sorry to the people whose numbers were dinner but we had no way of getting them back!) 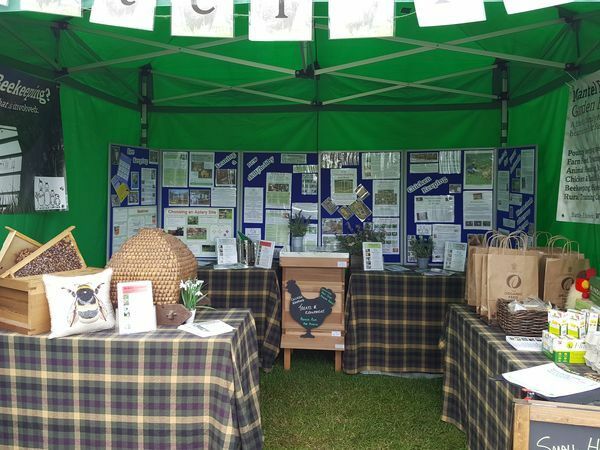 So, no really cute obvious picture as we hoped, but it was certainly an independent draw with a lucky winner selected - number 58 who has been informed and can now collect their prize of a chicken house or beehive! Keep an eye on our social media channels for updates and more details. The children's boat race, which was even more competitive than the adults'! 2018 is aiming to be even bigger and better with more teams, more events, more fun and more money for charity. So please come and join in for a great day out. Our British weather is famously changeable, more than able to freeze us then boil us within a close time frame. Even in mid-summer we can be scorching one minute then soaked and shivering the next. Although our chicken pens are fully stocked this time of year, we make every effort to ensure none are ‘overstocked’. It is essential that this is followed through to your back garden and smallholding chicken pens. Courses take place on Friday 27th July. We will give you an extra seat for free upon booking so that you can bring a friend or family member. Or book the morning for just yourself and come on the afternoon course for free! 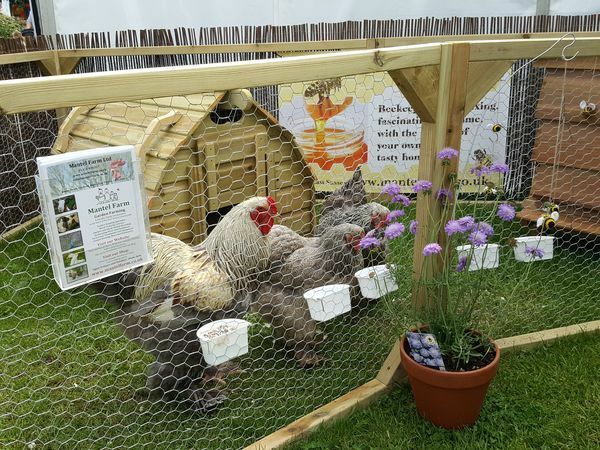 Learn about the pleasures and perils of keeping hens in your garden, their suitability as pets and the joys of having your own fresh free-range eggs. 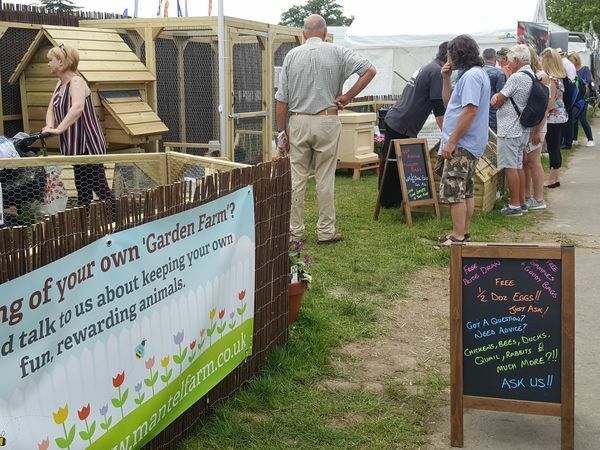 A practical and theory session for your chickens, carrying out a basic health check, caring for and handling your hens in the correct way. 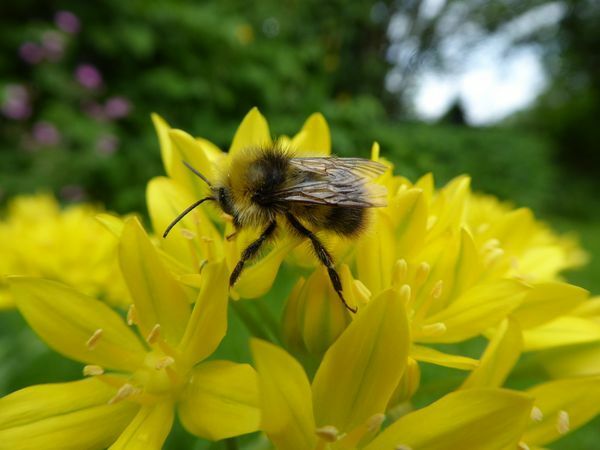 June has kept me busy with my bees after a relatively quiet previous month. My best, largest colonies earmarked for queen rearing obligingly each started to make a small number of queen cells, without me having to force them. In order to keep strong colonies for honey gathering, I just took the queen off in a nucleus or used the old queen (2016) to requeen a colony of dubious temper and health. After being flung into summer with the briefest of springs, our local fauna did not hang about in making up for lost time. I've never known a spring to be so stop-start! Whoosh, everything at once... 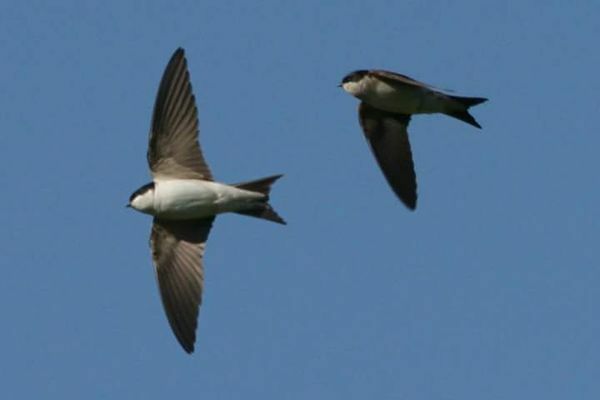 The fondant could come out of the hives, the farm duck pond erupted again in the mornings and at night with the calls of the springtime flock and the martins and swallows reappeared in our Sussex skies. To all who those supported Bertie in his bike ride with good wishes and kind donations - a huge thank you! 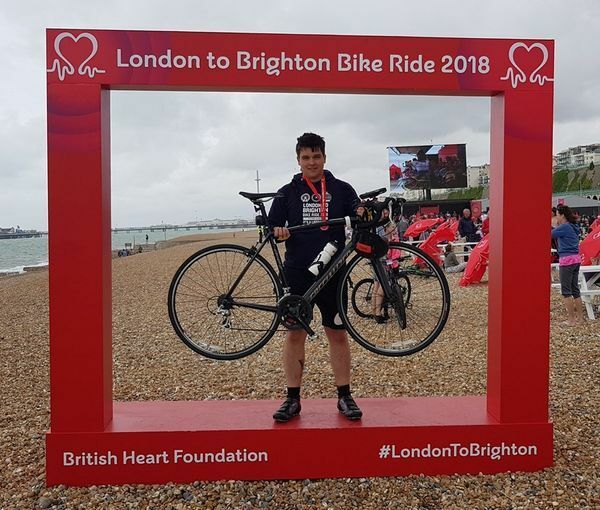 He completed the ride in a great time of 4 hours and raised £500 for the British Heart Foundation. He's already (maybe prematurely!) signed up for the next year's event, so perhaps he's inspired you to get fit, healthy and support a great cause?! 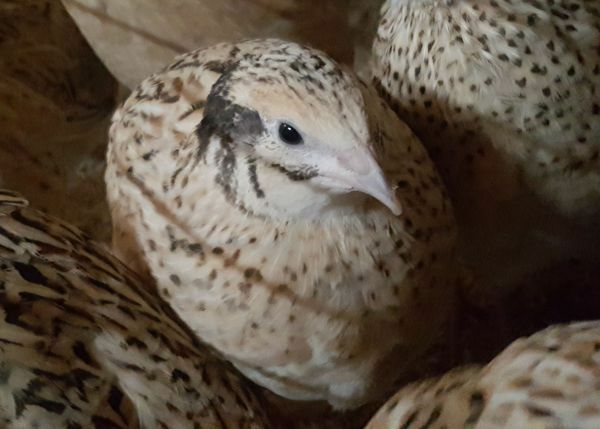 We now have our Golden Quail back in stock, along with the standard Quail. These lovely little birds make great pets, are easy to care for and lay lots of tasty little eggs. They take up very little space. Their life expectancy is around two years. These quail are a golden colour and have light tan feathers with dark specks on their throat and breast.